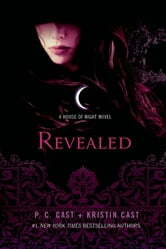 Revealed is the spellbinding eleventh and penultimate installment in the #1 New York Times bestselling vampyre series by PC and Kristin Cast. The House of Night series is an international phenomenon, reaching #1 on U.S., German, and UK bestseller lists, and remaining a fixture on The New York Times Children's Series bestseller list for nearly 150 weeks and counting. With more than 12 million copies in print, rights sold in thirty–eight countries to date, and relatable, addictive characters, this series is unstoppable. Now, in the eleventh and penultimate installment of the series, the action is more intense and the stakes even higher as Zoey and her friends battle to protect their school and home from devastating evil—all while balancing romances, precarious friendships and the daily drama of the House of Night's halls. Never would have imagined what takes place in this installment of the House of Night series of books. So much activity and exploring what is going on in the minds of many different characters as each chapter or section is told from another character's point of view. Definitely recommend this book! Espectacular Me encanta esta serie. Fue un buen material de lectura con una reveladora mirada al pasado de Neferet.